A’Layah Robinson, a resident of Sulphur, started Lemonade for Love, a lemonade stand with all proceeds going towards giving foster children hope. 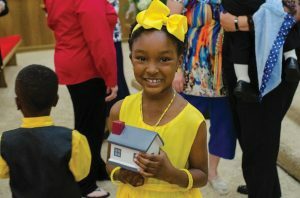 small idea turned into Lemonade for Love: an in-depth ministry giving hope to hundreds of children. The proceeds of her lemonade stand go towards stuffing bright yellow bags for foster children. Each of the bags contains what she proclaims are “the essentials” for foster kids—a “blankie,” Bible, stuffed animal and a toothbrush. So far, Lemonade for Love has donated around 700 bags to DHS. Their goal is to donate 900 by the end of the summer. It’s very important to A’Layah to include Bibles in the bags. 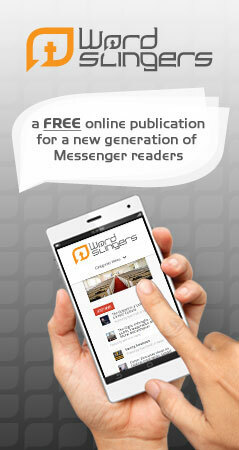 “I didn’t have a Bible, and I had never heard the Word of God before. I want other foster kids to know Jesus,” she said. A’Layah made it very clear that Christ is the most important part of her ministry; she never wants that to be overshadowed or censored. (OBHC), as a recipient of their Loaves and Fishes Award. The award recognizes children and youth who have donated time, talent or treasure to help others through the ministries of OBHC. The name of this award refers to a passage of scripture, John 6:5-13, which demonstrates what God can do with even a small gift when it is placed in the Lord’s hands. 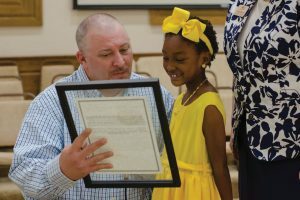 A’Layah was presented with the award on May 7 during a special foster care awareness service at Sulphur, Calvary. emphasized A’Layah’s desire to share Christ’s love with foster children. 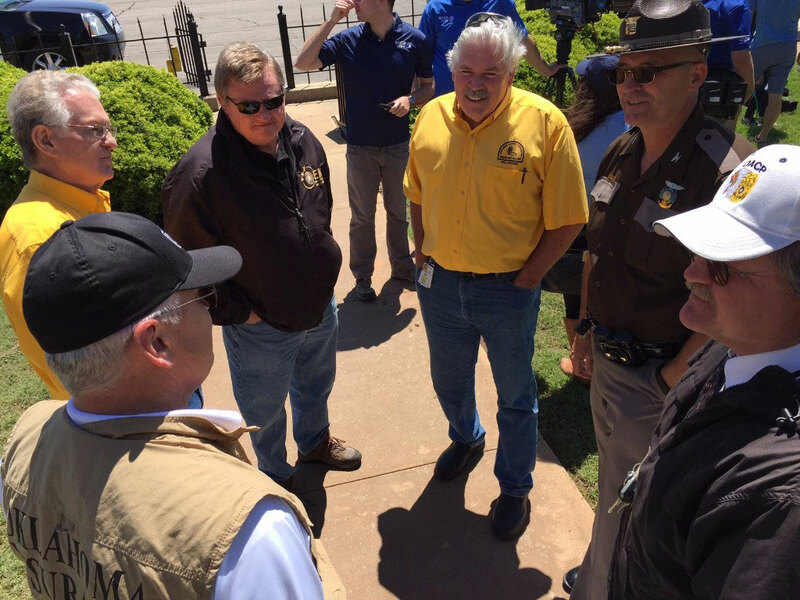 important to her that children who come into foster care know someone out there is praying for them,” Blanton said. Behind A’Layah’s ministry is her biggest fan—her mom, Misty Robinson. Misty adopted A’Layah and her two brothers from foster care. As A’Layah was called up to the stage to receive her Loaves and Fishes award, Misty beamed proudly at her daughter. 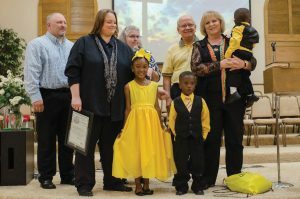 Right next to Misty was A’Layah’s grandparents, Jim and Dee Christie, smiling from ear to ear as their granddaughter was recognized in front of the congregation. As Pastor Tom Hefley gave a sermon about the importance of loving one another, he highlighted Misty’s dedication to her daughter’s ministry. The service concluded with the entire church body gathering on the stage to pray for A’Layah and her family. After the service, A’Layah and her family were treated to lunch at Potrillo’s Mexican Restaurant in Sulphur. The spirited 7-year-old gleamed with pride when her mom asked her to tell about her upcoming birthday plans. The mission of OBHC is to demonstrate God’s love by providing hope through empowering children and their families to follow Christ. To read more information OBHC’s ministry or their Loaves and Fishes Award, visit www.obhc.org. For foster care assistance or information, call Teri Blanton at 405/640-0622. View more articles by Lauren Capraro.